The stability of atoms can vary considerably from one element to the next, and also between isotopes of the same element (whose nuclei contain the same number of protons but different numbers of neutrons). While many isotopes are unstable and rapidly undergo radioactive decay, certain 'magic' isotopes show exceptional stability. Clarifying the properties of these stable isotopes is essential for understanding how the chemical elements formed in the early Universe. In an important step toward verifying various theoretical models, Shunji Nishimura and colleagues from the RIKEN Nishina Center for Accelerator-Based Science have now verified the magic numbers of an enigmatic 'doubly magic' isotope, nickel-78. The magic numbers for isotope stability are well established for isotopes with similar numbers of protons and neutrons. The seven most widely recognized magic numbers are 2, 8, 20, 28, 50, 82 and 126; these correspond to the number of particles needed to completely fill proton or neutron 'shells' in the nucleus. The nickel-78 (78Ni) isotope contains 28 protons and 50 neutrons, making it doubly magic according to this series. However, isotopes with such a large excess of neutrons compared to protons are predicted to have different magic numbers, and some theoretical models even suggest that 78Ni is not magic at all. 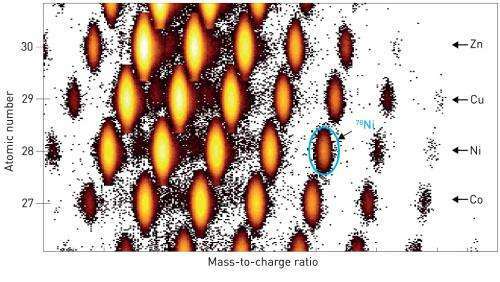 Consequently, much attention has been paid to the magic properties of 78Ni in efforts to verify theoretical models of nuclear physics and the formation of heavy elements. Settling the issue of the magic stability of 78Ni experimentally, however, has proved challenging. "Many experiments have been carried out to identify systematic trends in nuclear properties near 78Ni," says Nishimura. "Yet there has been no clear evidence on whether 78Ni is a double-magic nuclei due to the extremely low production yield of this isotope." Fortunately, RIKEN's Radioactive Isotope Beam Factory is capable of generating high yields of exotic and rare isotopes like 78Ni (Fig. 1). Using this facility, in combination with the newly developed WAS3ABi detector, the research team was able to perform measurements of 78Ni decay with unprecedented precision. The experiments confirmed the doubly magic status of 78Ni, providing valuable insights into the behavior of exotic nuclei with large neutron excess. Such neutron-rich nuclei play an important role in the production of elements heavier than the most stable element iron, such as gold and uranium. "We hope to solve one of the biggest mysteries of this century—where and how were the heavy elements created in the Universe?" explains Nishimura. The article stopped short of explaining how Ni78 was "doubly magic" or whether it has any significance. Are the nucleus magic numbers are based on the number of protons, neutrons, or both? If both, the significance of 28 protons and 50 neutrons is lost on me. A check of other sources shows that Ni 58, 60, 61, 62 and 64 are stable and that Ni 78 quickly decays to Cu 78 (and on up the periodic table to where the # of neutrons and protons has a better balance). There may be some momentary increase in decay times for Ni 78 (vs 77 or 79) but the article doesn't go into this. I guess I'll have to learn about this elsewhere. Yeah... What is the "doubly magic" property? Very good question and the article isn't really clear about this. But in the shell model of the nucleus, the nuclear core is treated very similarly to the shell model of the atom. The shell model of the atom is about how electrons travel around the nucleus. The electromotive forces and quantum mechanics plays a roll in how electrons move but also define how the wave function of the orbital defines the geometry. The first electron is the 1s state. You can build the full periodic table from 1s 2 2s 2 2p 6 ... etc. When the electron orbital is full ... that is equivalent to the magic states. Think of the nuclear magic numbers like you would the Nobel gasses Helium, Neon, Argon, Kryptop, Xenon, and Radon. where the magic number is number of electrons. Enough of this "magic, magical " crap. Just say it is 2-way stabilized isotope as it is the case. Scientists, please leave the moronic hypes to the sci-fi or fantasy writers. You are particularly bad at it. Indeed. There are already enough low information voters confused about the goddamned God Particle, let's not keep compounding the mistake. The article stopped short of explaining how Ni78 was "doubly magic"
So, if this stabilized isotope is truly stable, what is the measured half life? The article is lean on these details. Follow the bouncing baby link at the bottom of the article to the abstract with numbers and images. Still does not explain a "magic" property. Is that a way of saying it is more stable? Why try to make it seem so special? Still does not explain a "magic" property. Is that a way of saying it is more stable? It's like the electron orbitals from chemistry class (s, p, d, f...). It's just simple geometric fully filled configurations. If the configuration doesn't have any 'holes' it's (more) stable. The configurations without holes or excess units are called 'magic'. Think of the nucleons as constantly moving about in the nucleus. If they can jump to a 'hole' in the structure then that is a very energetic process. And whenever you have such a process - nucleons being the probabilistic critters they are - then there's a higher probability that something will escape/break (read: the half-life is shorter). In a stable configuration you have no such jumps and consequently the probability for a high energy motion that is enough to kick something out is lower (though never zero). It's Wiegner's way of saying it is simply 'beautiful' (or 'symmetrical'...which is what is often considered beautiful in science). In this case 'magic' is not the same as 'mysterious'. Actually the most interesting finding in this the double magic is how it fits in with Ni's other isotopes. Ni_78 with 28 protons and 50 neutrons. Isotopes of Nickle are found from Ni_51 all the way to Ni_76. And then Ni_78. Then the odd ball one is Ni_77. It doesn't exist -- it's too unstable. In my opinion what is 'magic' in this is how a filled shell tightly bound, where as a shell lacking one neutron is so unstable it can't exist. It gives us some interesting clues into the physics of the nucleus and the shell model.